The final call of the day was a dwelling fire. Engine 48-1 was first on the scene to the dwelling with smoke showing and an occupant and his child (training mannequin) at the second floor window. 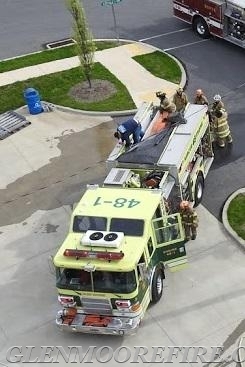 The crew quickly deployed a ladder and made the rescue. The crew then deployed a 1 ¾ inch hose line and made an interior attack on multiple fires on the first floor and basement. The otherfire companies made a response and assisted with fire suppression; water supply; search; ventilation; and overhaul. 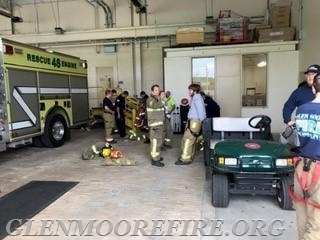 The crew from the Glen Moore Fire Company would like to thank the Wagontown Fire Company for the invitation and for the intense day of training. Special thank you to the instructors at the training center and to the Ludwig’s Corner Fire Company for covering our first due during this training.